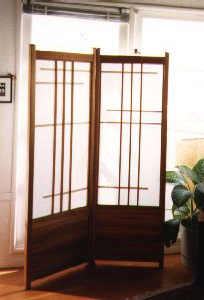 This design works well as a room divider and well as being situated near a window to diffuse the light. It can be hinged almost straight across to cover a large surface area, or hinged at a steep angle to fit a certain space. There is no limit to the size, dimension, or quantity of screens, which makes this a versatile design.